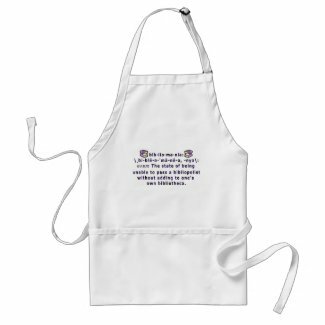 This is an apron about reading books and the obsession with that, but it just reminded me how it used to be that when people were writing novels or printing novels that had to wear aprons like these to protect themselves from the highly staining inks. Look at how far we have come that now all your writing is done in a realtime editable format that doesn’t even require you to get the list bit dirty (and forget wearing an apron). I just find that totally shocking.